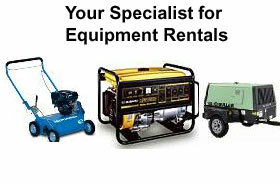 Contact Indy Rental & Sales, Inc., for your equipment or party rental needs. We carry a wide variety of both small and large equipment, ensuring we'll have something to suit your needs. All you need is a major credit card and a current Indiana driver's license. Visit our south side location in Indianapolis, Indiana, for a nice variety of construction and party equipment for both rent and sale. Stop in to browse our selection of party and construction equipment.